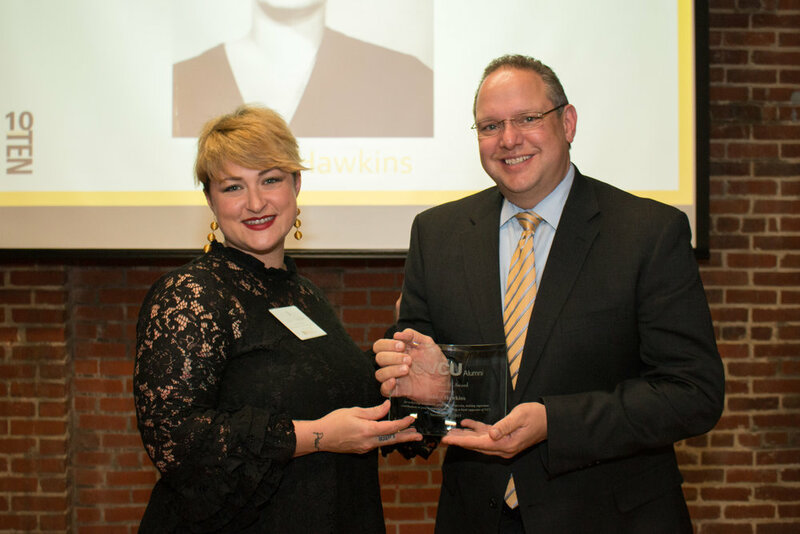 VCU honors Ashley Hawkins as one of its top 10 graduates of the last decade Richmond, Virginia (Nov. 17, 2017) – Ashley Hawkins, Executive Director of Studio Two Three, Richmond, Virginia’s only public printmaking studio, has been named by her alma mater, Virginia Commonwealth University, as one of the university’s top 10 graduates of the last decade. VCU Alumni’s 10 Under 10 awards celebrate alumni who earned their first VCU degree within the past 10 years and who have enjoyed remarkable professional success, made important contributions to their community and/or loyally supported the university. Hawkins was on the brink of leaving the VCU School of the Arts her junior year, when she started to etch, screen print and create lithographs. Her newfound passion reinvigorated her studies. “I was a fearful painter and almost quit VCUarts but then found printmaking and immediately fell in love,” Hawkins says. “The process was freeing. I could make 10 or 1,000 prints. I could change the plate or the screen, I could draw on my prints, collage — I was no longer afraid of ‘messing up.’” She knew that starting a community print shop was her calling and she did, at Richmond’s Plant Zero, after college. With eyes on establishing a larger collaborative space, in 2010 she opened Studio Two Three, Richmond’s only printmaking studio that’s open to the public. At the same time, she returned to VCU to earn a master’s in public administration with a concentration in nonprofit management. “I am an artist and Studio Two Three is my life’s art project,” Hawkins says. “I am fascinated by the constant excitement and challenge of creating and managing a growing organization and remaining responsive to our community needs.” Hawkins says it’s a dream responding to those community needs, which include creating a space that supports professional artists with tools to take their career to the next step. The studio offers classes, workshops and a retail store, among other features. In 2017, Hawkins launched the Art of Activism series. The first session gave more than 200 participants the ability to make protest posters and ephemera before the women’s march in Washington, D.C. “We will continue to offer opportunities to amplify our voices in our community, in a time when art has never been more important,” Hawkins says. Hawkins says earning a B.F.A. at VCU taught her more than lessons in art; she walked away with real-world problem-solving skills.